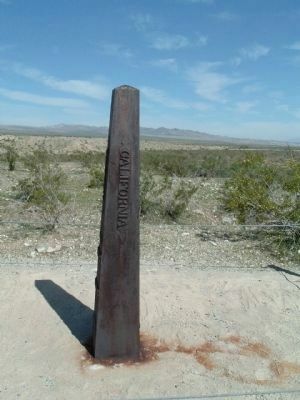 This boundary monument, a cast iron column erected in 1873, marks the southern terminus of the California – Nevada State Boundary established by A. W. Von Schmidt's 1872 – 73 survey. 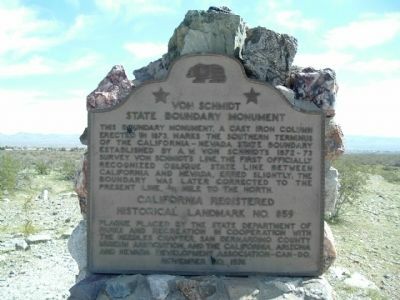 Von Schmidt's line, the first officially recognized oblique state line between California and Nevada, erred slightly, the boundary was later corrected to the present line, ¾ mile to the north. Location. 35° 0.844′ N, 114° 39.718′ W. Marker is near Needles, California, in San Bernardino County. Marker is on Needles Highway 0.1 miles south of Aha Macav Parkway, on the right when traveling north. Touch for map. Marker is in this post office area: Needles CA 92363, United States of America. Touch for directions. Monument is just beyond marker. History of the Fort Mojave Tribe (approx. 1.1 miles away in Nevada); Oatman (approx. 4.9 miles away in Arizona); Arizona Veterans Memorial (approx. 5.7 miles away in Arizona); In Memory of All Vietnam Veterans (approx. 5.7 miles away in Arizona); 9/11 Arizona Heroes Memorial (approx. 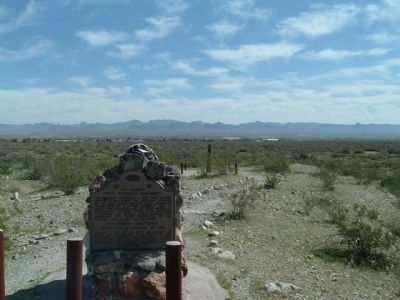 5.8 miles away in Arizona); Arizona Medal of Honor (approx. 5.8 miles away in Arizona); The Garcés Expedition (approx. 6.4 miles away in Nevada). More about this marker. This site was designated as California Registered Historical Landmark No.859 on April 26, 1973. This site is also Nevada State Historic Landmark No.188. 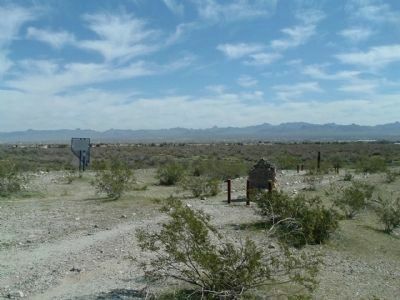 Nevada marker on left and California marker on right. More. Search the internet for Von Schmidt State Boundary Monument. Credits. This page was last revised on June 16, 2016. This page originally submitted on April 4, 2010, by Bill Kirchner of Tucson, Arizona. This page has been viewed 1,045 times since then and 6 times this year. Photos: 1, 2, 3, 4. submitted on April 4, 2010, by Bill Kirchner of Tucson, Arizona. • Syd Whittle was the editor who published this page.